Fact – I would probably starve to death if it weren’t for Pleasant House Bakery, so it’s a good thing that their food is so thoughtfully prepared and a bonus that it is all made from scratch and almost totally locally sourced. Art, Chelsea and their entire team are dedicated to showing Chicago that English food is anything but boring, and they prove it day after day churning out pies, pasties, beautiful desserts, fresh and inventive salads, crisp, delicious house made beverages, and always exciting daily specials, from burgers to pies to fish frys to the always stunning Sunday Carvery. I honestly cannot heap enough praise upon this establishment, nor can I overstate how much thought, care and love goes into everything they make here. I consider Pleasant House Bakery to be one of the greatest boons to life in Bridgeport and, as a 3-5 times a week patron, am proud to nominate them for a GNR. Over the last year, I’ve been continuously stunned by the quality of the food they turn out. The basics, their Royal Pies, Chicken Balti, Steak and Ale, Mushroom Kale and Cold Pork, are flaky, savory, and addictive wonders that have been beautifully photographed and documented by Ronnie Suburban here. The pasties are rich little steak bombs encased in a buttery, toothsome crust, and the gravy fries a loving and delicious tribute to Poutine. Their salads, so often an afterthought at other restaurants, are given the same care that everything else they serve is, with the greens and most veggies coming from a number of plots maintained by Chelsea’s brother Morgan all over Bridgeport. In the summer, they are symphonies of fresh produce, in the winter, they are gentle reminders that spring will come again. Even the humble pea is given special treatment, gently cooked and carefully dressed with butter and mint, turning this humble vegetable into something very special. The Scotch Eggs are a thing of wonder with their house made sausage and slightly runny center that make them a perennial favorite. The daily specials ~ AKA, my dinner ~ always please as well. Bangers and Mash delight with house made sausage, rich mashed, and a savory onion gravy, burgers, always served on a homemade bun of some sort, are perfectly cooked to order and have inventive, yet simple toppings, the weekly special pies (as well as the occasional quiche) are creative tributes to whatever is in season, and the Sunday Carvery demonstrates Art’s incredible skill with whatever happens to be fresh and available. I had the best piece of salmon in my life there last year, and have enjoyed other Sunday offerings from prime rib to duck. It makes me look forward to Sunday evening. The sausage rolls, on offer whenever Art’s brother John has the time to make them, are so wonderful that I buy them in bulk now and keep them in the freezer for late night snacks. Then there is the fish fry, which I consider to be the best in Chicago. Art only uses sustainable fish, so it varies from week to week, but you get an enormous, delicately battered piece of fish, along with their fantastic chips and an incredibly pleasant tartar sauce. Malt vinegar, obviously, is available on each table. The fish fry has been well documented here and here: and here. Desserts are carefully and lovingly prepared by Chelsea each day, and follow PHB’s credo of local and seasonal, so they vary from week to week. They may have meringues, almond tarts, treacle pudding, luscious parfaits loaded with fruit, cake, even humble oatmeal cookies. I'm not much of a dessert eater, but it's all impossibly good and I rarely resist. Last edited by Ursiform on March 2nd, 2012, 11:52 am, edited 1 time in total. I am delighted this was the first nomination for the season, because it certainly is in spirit with what a Great Neighborhood Restaurant has always meant to me. Great write-up, Ursiform -- this is a truly unique place, from their lovingly prepared food to their smiling delivery service to Maria's. From their use of food grown in their urban garden to offering urban gardening lessons to the community. And, Art & Chelsea are great people to boot. I would give them every award if I could. Count me a fan of PH Bakery as a GNR! The definition of GNR for me. The food is absolutely top-tier; the people--personable, endearing. It's all Bridgeport, both inside and out. And I love that. Pleasant House has my whole-hearted endorsement. Whenever I have time for lunch, PHB's savory pies top the list of options. I may have to stop by after writing this. mtgl wrote: The food is absolutely top-tier; the people--personable, endearing. Cathy2 wrote: And, Art & Chelsea are great people to boot. Agreed - this is a huge part of the draw for me. Each time I go in, I'm greeted by name and often a hug. Art, Chelsea, John, Morgan - the entire staff, they could not be any warmer or personable. It feels like eating at a friend's home. aschie30 wrote: this is a truly unique place, from their lovingly prepared food to their smiling delivery service to Maria's. It's my favorite one-two punch in Chicago, takeout from PHB, consumed with a terrific beer next door at Maria's. I wish I could nominate both places, they are, combined, my home away from home! Bridgeport is a great place to be these days. I'm sure PHB is a shoo-in even without my nod, but I just have to say that we LOVE the food and the people as well. So happy to have a place like this in Chicago, not to mention pretty darn close to Pilsen! It took me a while to finally get there, and I started with a chili concoction that, though technically superb, was a bit of a mess for me on the tastebuds, neither doing the chili or the pie justice. The Bride did better with the Mushroom Kale, so I countered with steak and ale to go. No question, I saw a good pie in there, I just had to find it. Let me see if I can sum up. The pie was perfect, as good as any I have ever had in the most exalted pubs in the UK. Perfect crust, delectable ingredients, delicious. The setting is unlikely, incongruous, unexpected; the service is friendly, engaged, helpful. And they have the right condiments, too. Finally, I could just watch them make the pies - a precise and elegant dance, leading to the sublime moment when a pie appears on my plate. PHB is wonderful, a joy. I have a huge crush on Pleas­an­t­ House. 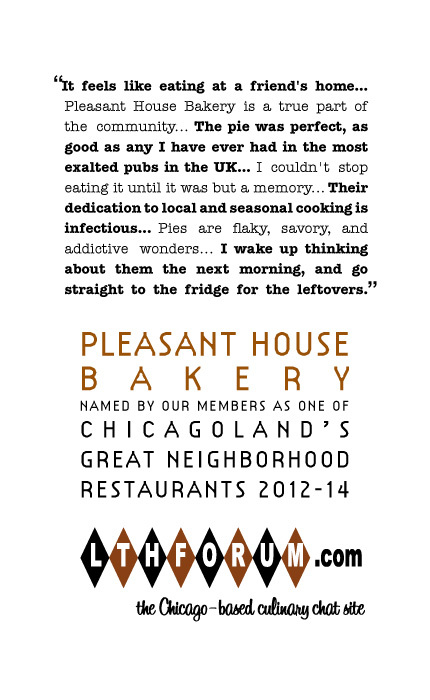 And as evi­denced in the con­tin­ual shower of praise bestowed on them by Chicago’s food writ­ers both pro­fes­sional and ama­teur, the open­ing of this mod­est café in the Bridge­port neigh­bor­hood is one of the most excit­ing things on our culi­nary scene to hap­pen in quite awhile. They do every­thing right. Let’s start with the neigh­bor­hood, anchored on the cor­ner of Mor­gan and 31st, the devel­op­ment of this lit­tle zone, insti­gated and nur­tured by Ed Marszewski (PH’s land­lord and my good friend) con­sists of three inde­pen­dently run busi­nesses– Bridge­port Cof­fee Shop, Maria’s bar (owned and run by Ed and fam­ily) and Pleas­an­t­house. On that cor­ner you pretty much ful­fill all of life’s basic needs. It is a lovely cor­ner, with two diag­o­nal streets on either side of the Maria’s and PH, on a sunny day, there is a open­ness to the streets that feels some­how small town– like. And these busi­nesses oper­ate in praxis of firstly serv­ing their com­mu­ni­ties. Amongst the hip­sters and food­ies snap­ping pho­tos of their pies, all of whom Art, Chelsea, Mor­gan, and co. treat with the warmest hos­pi­tal­ity pos­si­ble, there is real evi­dence of a neigh­bor­hood fol­low­ing. You’ll see many of the same faces on that block and the famil­iar­ity and con­vivi­al­ity with which the PH staff inter­act with the reg­u­lars lets you know that this is a com­mu­nity– ori­ented project. Con­ver­sa­tion always abounds at PH and when I step into the shop I relax– part of the expe­ri­ence for me is chitchat­ting with Mor­gan about dub pod­casts or for­ag­ing. I’m in no hurry to grab my food, eat, and get out of there. And some­how, even on the busiest days, Art always finds the time to stop by the table and talk food pol­i­tics with me. I sin­cerely count these guys as friends. Sure I am another foodie fan­boy, but I always feel like I am treated like part of the crew when­ever I hang out there. Art has been plenty gen­er­ous to me, he hosted my class for a lunch, lec­ture, and tour of their oper­a­tion that nour­ished and inspired my 15 School of the Art Insti­tute fresh­man– who could not stop talk­ing about the expe­ri­ence for the rest of the semes­ter. What other restau­rant has a com­mit­ment to ped­a­gogy? The deep com­mit­ment these guys have to stew­ard­ing not only their neigh­bor­hood in a social sense but also in an eco­log­i­cal sense is unde­ni­able. Mor­gan Kaber­loh, Chelsea’s brother was brought up from Florida to serve as their farm direc­tor. Mor­gan grows a great deal of the pro­duce they serve right in the Bridge­port neigh­bor­hood uti­liz­ing poly­tun­nel tech­niques and inten­sive crop rota­tion to max­i­mize yield accord­ing to the tem­pera­ments of the sea­son. Just a few weeks ago– at the end of Decem­ber mind you– I had the plea­sure in eat­ing the year’s last salad greens, amaz­ing. Oh I could gush on and on about their Eng­lish coun­try­side cook­ing, but you should go eat this as-lovingly-made-as-possible grub for your­self. Ulti­mately, I love the pol­i­tics of Pleas­an­t­house– in a way a rever­sion to an older, sim­pler model– before cor­po­ra­tions took over our struc­tures of con­sump­tion– a fam­ily run busi­ness spe­cial­iz­ing in a small set of prod­ucts made arti­sanally from scratch work­ing with other small local pro­duc­ers and serv­ing their imme­di­ate com­mu­nity. But I also think there is an urgent con­tem­po­rane­ity about this approach– an ulti­mate com­mit­ment to sus­tain­abil­ity of com­mu­nity, the earth, and an opti­mistic vision of the future with peo­ple of a new gen­er­a­tion of small busi­ness own­ers doing things their own way, the right way. Long story short, the epitome of Great Neighborhood Restaurant. Jefe wrote: Long story short, the epitome of Great Neighborhood Restaurant. I agree. In my mind, this was one of 3 no-brainers this GNR season. I don't know what else I can say beyond what I've already posted on the main PHB thread (linked above). Stopped in today with my wife for yet another great meal. Art recognized us immediately, even remembering that we come from Oak Park, and we chatted a bit throughout our time there. My wife's mushroom and kale pie was even better than the last time, based on her opinion that the mushrooms were slightly more flavorful. Butter peas with mint remain an excellent accompaniment. I felt a little strange ordering a non-pie dish, as their crust is something I dream about for days after each visit, but the bangers and mash proved to be a worthwhile exception. The onions and gravy were done very well, and as I finished I found myself wishing desperately for some bread to sop up the last of the gravy. Salted chocolate and caramel ganache tart was a nice end to the meal, though I am glad we split a slice given the richness of that ganache. House-made sodas remain one of the rare times these days I'm willing to take on the calories of a soda, and well worth it. Without doubt, a slam-dunk GNR - everything about PHB and everyone there is what a GNR should be. A favorite of favorites, and no wonder with the price of meat. Pastry and spices to stretch the imagination and appetite, ginger brew to knock it back, fresh herbs and fry-up to round it out, and proprietors just eccentric enough to make it sing. Heartily supported, and eaten. You'll know where to find me if I go missing. I thought that I might be the first to mention their Platonic Scotch Eggs (often a rather sad afterthought as barfood), but Ursiform beat me to it. PHB Scotch Eggs are ethereal. Wonderful spicy sausage and slightly runny egg, and perfectly fried. It is a thing of wonder. I've had Pleasant House pies twice now. I bought my first (mushroom kale) at Green Grocer and heated it up at home. It was quite good. Yesterday, I decided to take the drive from the northside to eat at ground zero, trying a chicken balti with a side of peas. So good. The staff couldn't be nicer. The food is excellent. The crust is perfect. The fillings are fantastic. Absolutely a GNR. Love the place, love the food! Haven't been able to experience the Maria's/PHB combo but hoping to remedy that soon! GNR--yes!! If anyone cares to join me (I realize it's very short notice), I'll be doing my normal Friday night thing and getting the fish fry to go from PHB and taking it next door to Maria's. The patio is open, and few things are more pleasant than PHB with a Zombie Dust. I'll be there around 5:30 holding down a table if anyone would like to give PHB a shot this evening. I definitely think this is a GNR for their savory pies. Their pies are total comfort food - warm delicious stew wrapped in a crusty, buttery pastry. I had the steak and ale and found it to have a beefiness and saltiness that I found pleasing with a nice balance with the crust. I've also had their trifle, which really helps play up their British influenced menu. The cake is fluffy, the cream is light, the fruit adding a sweet/sour complexity, and best of all, it's not too sweet. I didn't care much for their deluxe fries though. It's fries with gravy and cheese. The gravy was much too thin so it didn't coat the fries well and a little too bland to add much beefy flavor to the fries. They also didn't put enough cheese on it. I really, really loved the deluxe fries. I wish I could justify ordering them and a pie, and I'm sad every time I go and I can't. I loved the beefy, salty gravy and loved the relatively light touch with the cheese. Mmmm. I love PHB. So much. The Friday Fish Fry sounds very interesting, as does the Sunday tea. I took a ride to Pleasant House yesterday afternoon and there were a number of tables reserved, with a tri-tiered cookie plate on them ready for the special Sunday Tea, which is available by reservation. I got a daily special of an individual kale, Italian sausage and aged cheddar quiche served with a small green salad. The crust was excellent, which goes without saying for any crust coming out of Pleasant House's kitchen, but the filling was also notable. The custard was exemplary. Not overcooked and dense, but soft and nearly omelet-like in texture. Although I was full half way through the quiche, I couldn't stop eating it until it was but a memory. To echo what others have said above -- a quintessential GNR. Absolutely in favor of this nomination. Pleasant House, count me a fan! A perfect GNR: one that I wake up thinking about the next morning, and go straight to the fridge in my undies for the leftovers. I'll add one more "No-Brainer GNR" to the chorus. Love how the crust stands up to the fillings and remains crisp and flaky without wimping out. Their fish and chips had the Brit bf proclaim that it's the best he has had in States over the past 20+ years. Thick cut of excellent quality fish, battered and fried to perfection, even after an hour in the box and crisped back up in the toaster oven. Definitely on our regular rotation, and should definitely be a GNR.